Cool with just enough quirk, the Dragon Lupah breathes life into your boring old watch. You'll find a rounded crown and function pushers on the right as a croco embossed strap buckles around your wrist for a bold blend of hard and soft. Built to be shown off, it stakes its claim on your wrist with a round stainless steel case and unidirectional rotating bezel. The thick case gets everyone to sit up and take notice with a luminous Tritnite diver's scale and a hinged crown protector on the right. Bracelet: Stainless steel. Crown: Push/pull. Dial Material: Alloy. Invicta Speedway. Green Chronograph Buttons. Black silicone watch band with gold-tone stainless steel insets. Dial Window Material Type. Round green analog face with gold and orange detail. Black and Orange seconds hand. Layered and cut-out, the dial adds intrigue to the already-impressive design while a crown protector does its job on the right. Talk about a powerful predator. Series: Sea Hunter. 18 Karat Gold Plated Case and. Invicta Bolt. Luminous hour and minute hands. Dial Window Material Type. Swiss Z60 Chronograph Quartz. Tritnite night glow. Watch Information. Date Window at 4 o'clock. Round Green analog face with black and oyster detail. Style/model: 25205. 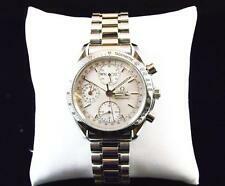 D Quartz Chronograph. Invicta website . Once you get to the specific watch, there is a link to download the instruction manual. It's that easy! Watch Country of Origin: China. Watch Details. Model number 96L116. Dial window material type Mineral Flat Crystal. From the Crystal Collection. Band Color Silver-Tone. Band Material Stainless Steel. Dial color Mother-of-Pearl. Case material Stainless Steel. We Are Authorized INVICTA Dealer. (Connected with the world’s highest rated hybrid smartwatch app and equipped with a battery lifespan of up to two years, the water resistant and durable Kronaby is with you for the long run. 3) find my phone. Style/model: 26540. Invicta website . Once you get to the specific watch, there is a link to download the instruction manual. It's that easy! Dial Material: Abalone. Watch Country of Origin: Thailand. 200M WR, SWISS Made, Luminous Dial, Calendar, Rotating Bezel. Dial: Luminous Dial with Black Accents and Date Display. It might be a simple fix or it might not, I have no clue. It is a very beautiful watch so if you can get it running properly you'll have a great piece! Invicta 24418 is equipped with an 18mm wide two tone yellow gold plated solid stainless steel bracelet with a fold over safety lock clasp. Layered and cut-out, the dial adds intrigue to the already-impressive design while a crown protector does its job on the right. Talk about a powerful predator. Bracelet: Stainless steel. Watch Details. Designed in the unmistakable Lupah shape, this one demands to be seen with a polished and brushed bracelet. And what’s on the inside is just as good as what’s on the outside with an abalone dial that lights up with Tritnite accents. Components: Swiss. Tone: Black, Gold. Crown Type: Push. Bezel Color: None. Bezel Material: Stainless Steel. Case Material: Stainless Steel. Case Size: 56mm. Case and Dial. Band Material: Leather. Dial Shape: Square. Case Material: Stainless steel. Dial Material: Stainless steel. Model 22291. Authorized Invicta dealer. Clasp: Buckle. Strap: Genuine Leather. Watch Details. Stainless steel case with a two-tone (silver and yellow gold-plated) stainless steel bracelet. Fixed yellow gold-plated set with crystals bezel. Mickey and Minnie logo dial with luminous yellow gold-tone hands and Roman numeral hour markers. Crystal-set Romen numerals mark the 6 and 12 o'clock position. Dial Type: Analog. Luminescent hands. Date display at the 3 o'clock position. Caliber: PC32A quartz movement. Scratch resistant mineral crystal. Pull / push crown. Solid case back. Case size: 38 mm. Case thickness: 13 mm. Round case shape. Band width: 18 mm. Band length: 8.3 inches. Fold over clasp with a safety release. Water resistant at 200 meters / 660 feet. Functions: date, hour, minute, second. Casual watch style. Invicta Disney Limited Edition Mickey Logo Dial Ladies Watch 24418. Layered and cut-out, the dial adds intrigue to the already-impressive design while a crown protector does its job on the right. Talk about a powerful predator. 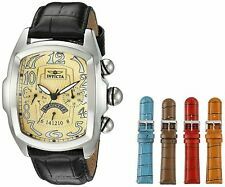 Warranty Invicta 3 Year Original Manufacturer's Warranty. Invicta 70mm Sea Hunter Gen II Swiss Made Chronograph 18Kt Two Tone SS Bracelet. Condition is New with tags. Shipped with USPS Priority Mail. Case: Black with pink/purple hands. Dial: Black. Case size: 35MM. Screw Down Crown and Case Back. Stainless Steel Case and Band. Luminous Hands and Markers. Hackable Second Hand with Hand Winding Capability. Specially developed for those in the know, Reserve is a reinvention of the superb to create the ultimate in horological finery. Style/model: 16126. Invicta website . Once you get to the specific watch, there is a link to download the instruction manual. It's that easy! Dial Material: Alloy. Watch Details. Watch Country of Origin: China. Seiko Samurai SRPB51. Watch has some awesome mods, including a black Lumed Ceramic Bezel Insert from LCBI ($45) and a black Crafter Blue CB09 rubber strap ($65). Stock crystal. Amazing combo for an everyday sport watch or true diver tool watch on the weekends. 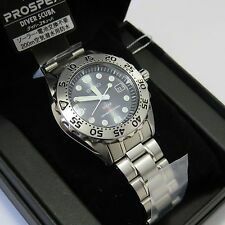 Watch also includes original box and papers, stainless steel bracelet with dive extension and all links, spring bars, etc. 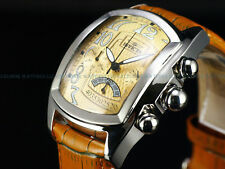 Keeps excellent time, as good or better than my Tudor Bronze or Vacheron Overseas. Watch is in good condition, with some scratches on the lugs, barely visible as they are covered by the bezel assembly. Condition is Pre-owned. CONUS shipping only, watch sold as is, no returns/refunds or exchanges. 3 Years Original U.S SEIKO Warranty. Screw down crown. Stainless Steel Case. Luminous Lombrite Hands and Markers. 3 years original manufacturer warranty. 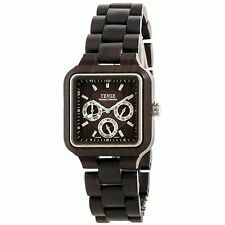 Express Multi-function Mens Watch Red. Brand new in excellent shape and condition with box and instructions just missing the top box to cover the watch other than that is gorgeous. From a smoke free and pet free environment. Get unmistakably sleek style when you wear this smooth, silicone-strap watch. With a perforated-style bezel and silver-toned details, this timepiece really shines. A textured ribbing underneath prevents slippage. Watch case: 45 mm, Quartz Analog Japanese Movement Chronograph face with date and day of the week Flat, silicone strap with adjustable buckle Nickel-free, lead free, hypoallergenic Water resistant, not submersible Please check out my other listings. If the Reserve Bolt Zeus Magnum sounds intimidating, that’s because it is. In silver-tone with your choice of boldly colored blue dial, it strikes fear into the heart of your schedule. Bracelet: Stainless steel. ABOUT INVICTA WATCHES. 100% AUTHENTIC. 100% Authentic. Condition is Pre-owned. Model number ES3529. Part Number ES3529. Dial window material type Mineral. Dial color Blue. The watch is used shows signs of wear, (this was a trade in)and scuffing on the crystal, new Battery. Inner circle is second. Middle circle is minute. Outer circle is hour. Type: Wrist Watch. Circular hands design, moving second hand. Color: black or white. Band Color: Silver. Stainless Steel. Watch Shape. Face Color. Year of Manufacture. Swatch Originals. About The Wrist Outlet. Case Color. Water Resistance. CASE SIZE - 43mm. BAND MATERIAL - Genuine Alligator. BUCKLE PLATING - PVD Gold. BUCKLE SIZE - 20mm. STRAP COLOR DETAIL - Black. STRAP LENGTH - 120mm x 80mm. STRAP WIDTH - 20mm. TOP RING PLATING - PVD Gold. 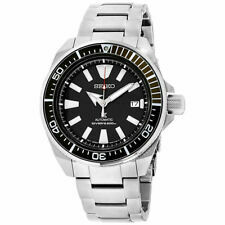 Used Seiko Samurai SRPB51 for sale. The watch was only worn a few times and it is still in excellent condition. Includes the original box and extra links for the bracelet. Want to take your sense of style to the next level?. Made of eco-friendly natural sustainable bamboo, this watch is super light weight for comfortable wear, and water resistant. ECO-FRIENDLY- Made of eco-friendly natural sustainable bamboo without any toxic chemicals. Mens Watch, cufflinks and money clip. Gold plated.Hypoallergenic. FREE SHIPPING! Watch, cufflinks and money clip set. Gold plated. Cut an image fellows! It's all about the details! Like ZZ Top song "Every girl crazy 'bout a sharp dressed man.". Black dial. Aluminum case. Case 45mm. Daily Deal. A signature may be required on higher-end orders. Hypoallergenic watches are wardrobe essentials that you can wear to always ensure that you arrive on time. Made from hypoallergenic materials, these watches will be a great fit for anyone with sensitive skin. Pink band wristwatches are great for adding an eye-catching detail to any look. With a unique band color, these pink watches are perfect choice for expressing your personal taste. Beige band watches are traditional and tasteful accessories that will never go out of style. They have a highly sophisticated appearance for a refined and dynamic accent piece. Great for anyone who leads an active lifestyle, sports wristwatches will take your fitness routine to a whole new level. 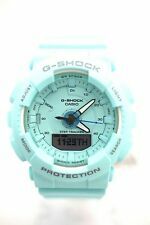 These watches are usually shock-resistant, meaning that they will remain unaffected by accidental impacts. With their distinctive design and impressive craftsmanship, luxury watches are great for experiencing unparalleled style and elegance. 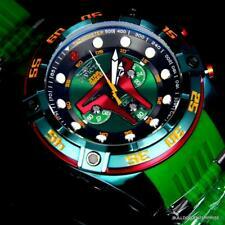 Designed from the highest-quality materials, they are high-end timepieces. 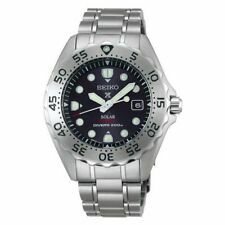 Built to withstand slight contact with water, 30m (3 ATM) wristwatches will not be damaged by damp or humid conditions. They are typically built with snap-on case backs. 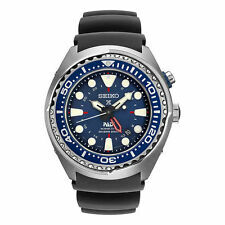 50m (5 ATM) wristwatches are built to withstand being partially submerged in water. They may be worn for light swimming activities. For hypoallergenic watches, what are some of the top selling items on ebay?